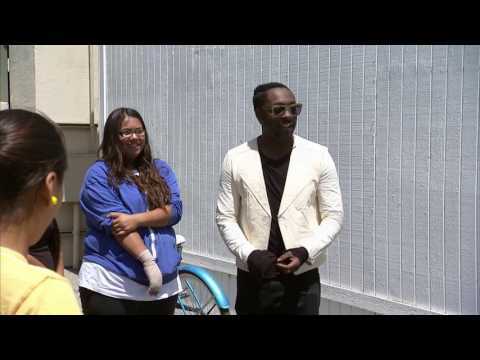 will.i.am.com iamangelfoundation.org "Planet of the Apps"
will.i.am is a multi-faceted entertainer and creative innovator best known as the front-man and founding member of The Black Eyed Peas, who have sold 33 million albums and 58 million singles worldwide. Also a successful solo artist, will.i.am has won seven Grammy Awards. When not in the limelight, will.i.am works behind the scenes with some of the industry’s biggest names and has produced music for artists such as Justin Bieber, Rihanna, U2, Usher, Justin Timberlake, Nicki Minaj, Lady Gaga, Britney Spears, Kesha, Miley Cyrus, Michael Jackson, and more. In 2013 will.i.am released "#willpower," his most recent solo album featuring a bold fusion of hip-hop, R&B, and electronic/dance music to create irresistibly infectious and genre-warping party anthems. "#willpower" includes the multi-platinum single, “Scream & Shout” which has sold over 2.5 million copies. will.i.am is the first recording artist to send a song to Mars in collaboration with NASA’s Curiosity Mars Space Lab. Space and music industry firsts were achieved on August 28, 2012 when “Reach For The Stars (Mars Edition)” was played back from Mars during an i.am.angel foundation youth education event hosted by NASA’s Jet Propulsion Laboratory. In addition to his music career, will.i.am is very active in front of and behind the camera. His television credits include "i.am.mars: Reach for the Stars" for Science Channel and the prime time special, "i.am FIRST: Science is Rock and Roll." He recently completed Season 7 as a Coach on "The Voice" in the U.K. and Season 1 of "The Voice Kids" in the U.K. He is also an executive producer and mentor on "Planet of the Apps," an unscripted series co-produced by Propagate and Apple. will.i.am is a co-founding equity shareholder in Beats Electronics, the creators of Beats by Dre headphones. Leveraging his experience in the consumer electronics industry, will.i.am introduced his i.am+ foto.sosho camera accessory for iPhones in London in 2012. With a commitment to inspire kids to stay in school and go to college to become the leaders of tomorrow, will.i.am advocates for the importance and power of a good education through the i.am.angel foundation. The i.am scholarship provides future leaders and innovators with comprehensive financial assistance to complete post-secondary education. The i.am.angel foundation has also created i.am.STEAM (science, technology, engineering, arts and math), an elementary and middle school initiative to provide underserved students with learning and interaction opportunities beyond the classroom. In addition, the i.am angel foundation is also active in the U.K. through a STEM education and computer skills joint initiative with The Prince’s Trust. will.i.am was named to Fortune’s 40 Under 40 Young Business Leaders to Watch issue in October 2013. He is the recipient of seven Grammy Awards, a Latin Grammy Award, an Emmy Award, two CLIO Awards, two NAACP Image Awards, a Root.com 100 Award, a VH1 Do Something Award, the BMI President’s Award, and a Webby Award.